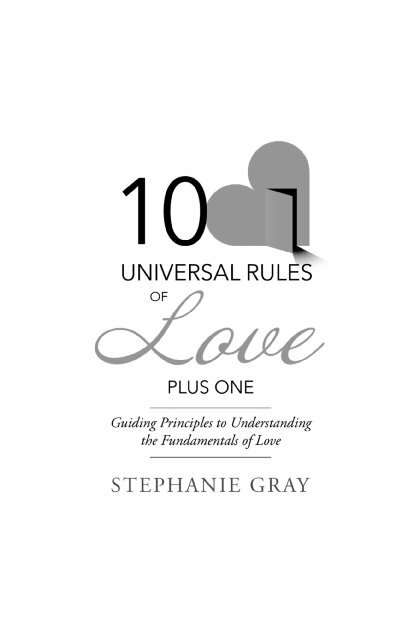 10 Universal Rules of Love - Plus One gives a fresh perspective on the journey to self-love. Through real life and comedic examples, this book provides guiding principles that will help you to navigate through self-defeating habits to a sustained healthy self-love; and ultimately to love with others. 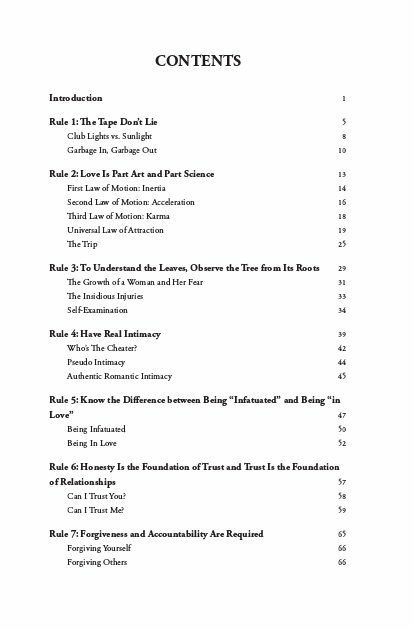 10 Universal Rules of Love - Plus One will guide you through your process of support system selection, coping with past hurts, expectations you have of yourself and others, as well as other important components of your love habits; then shine a light on unhealthy love habits, and give you actionable steps to eliminate unhealthy habits, and replace them with healthy ways of thinking and acting in love. 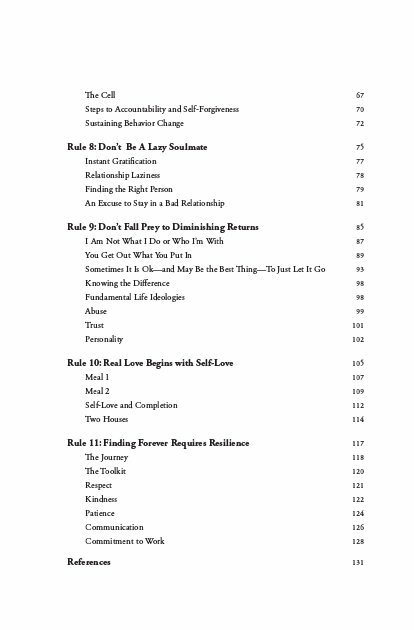 At the end of the journey in 10 Universal Rules of Love - Plus One, you will understand and be well on your way to completing the work necessary to make your journey through love and life a healthier and happier one. 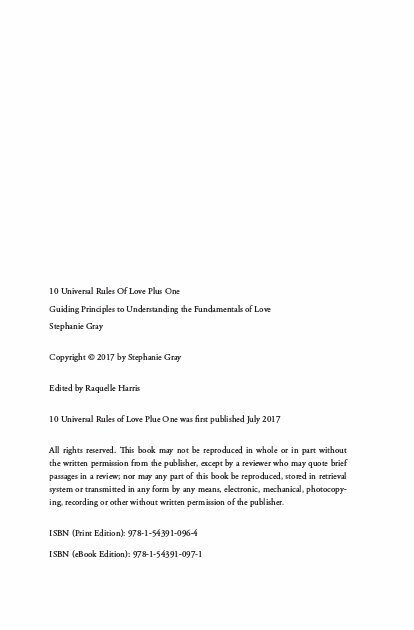 10 Universal Rules of Love - Plus One will: • Engage you in thought provoking introspection about your emotional habits • Help you understand the science of love • Clearly define and show you how to identify, the difference between being In Love vs. being Infatuated • Give you actionable steps to forgiving yourself and others • Give you guide posts to establishing and maintaining healthy relationships with others and even knowing when to let go The 10 Universal Rules of Love - Plus One seeks to guide you through your process support system selection, coping with past hurts, expectations you have of yourself and others, as well as other important components of your love habits; then shine a light on unhealthy love habits, and give you actionable steps to eliminate unhealthy habits, and replace them with healthy ways of thinking and acting in love. If you're ready to explore yourself, your relationships and emotional habits unlike ever before, then talk about it with some laughs laced with honesty and truth, you are ready for the journey this book will guide you through. 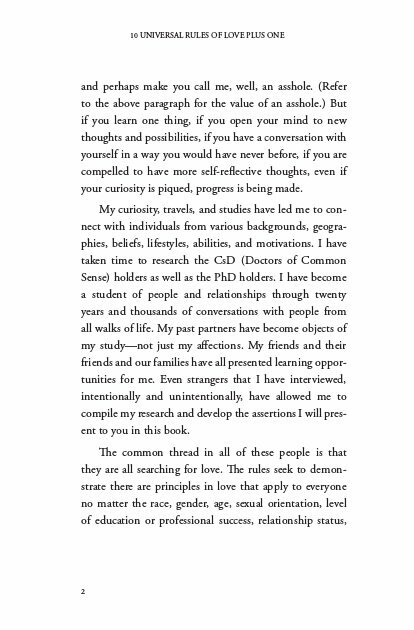 At the end of the journey in 10 Universal Rules of Love - Plus One, you will understand and be well on your way to completing the work necessary to make your journey through love and life a healthier and happier one. Stephanie Gray is a former international professional athlete and 15-year healthcare sales executive who is transitioning to a career of writing. Studying to earn her MS in Psychology and Exercise Science, Gray developed her theory of human relativity. 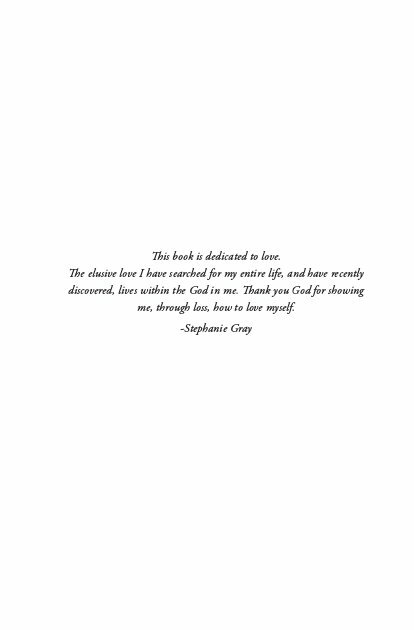 Through her writing and other creative outlets, Gray seeks to demonstrate how the human condition (physical, mental, emotional, and spiritual) can be healed when we recognize and respect how each component of our individual humanity is interconnected and are interdependent on one another; just as all of humanity is.